This PC-based flight planner allows you to perform basic IFR flight planning on your desktop or laptop computer. Chart depiction includes airports, navaids and terrain. Includes access to hundreds of aircraft models. FliteStar is our PC-based flight planner that allows you to perform flight planning on your desktop or laptop with the ability to use the Internet to download weather and file flight plans. FliteStar has three versions - VFR, IFR and Corporate - to provide the flexibility of features you need to suit your flight planning needs. You also decide how often you need to update your NavData, so it's your choice to update NavData once per year, three times per year, every 56 days or 28 days. FliteStar is sold by geographic coverage, and there are six regions to select around the globe. 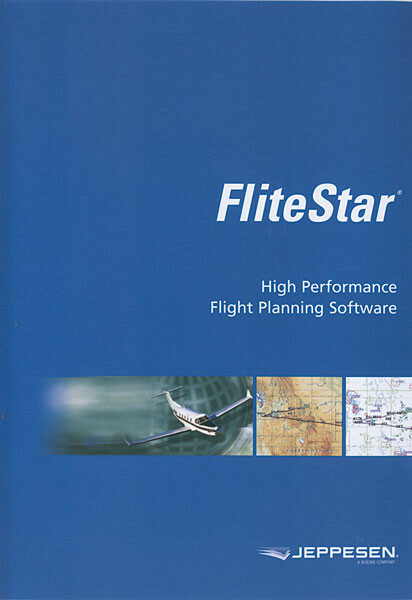 Use advanced aircraft models to provide flight planning for advanced piston and turbine powered aircraft with FliteStar Corporate. Depict various chart elements, such as airports, VORs, enroute and terminal fixes, low and high airways, restricted and special use airspace, FIR boundaries, terrain and geopolitical features and more. Hundreds of aircraft models are loaded and available for use in FliteStar. Because FliteStar is PC-based, it's fast and no Internet connection is needed to do flight planning.